As operations manager at Holland Farms, Carla Shepherd is constantly busy making sure the day-to-day operations of the bakery and deli run smoothly. For the past four years, Carla has served in this capacity at Holland Farms – a career choice that makes her look forward to coming to the office every day. Carla said that Holland Farms is a great place to work for a combination of reasons. “I enjoy the customers and the staff here at Holland Farms,” Carla said. “The behind-the-scenes people are amazing – I’m always in awe of the amount of product that we make here each and every day.” Carla also said that because Holland Farms produces high-quality goods, an unhappy customer is a rarity. “The consistency of the product we sell keeps customers happy – and coming back for more,” she said. When she isn’t at work, you’ll find Carla spending time with her husband of 23 years and her son, who is a senior in high school. A life-long resident of Oneida County, Carla also enjoys reading and travel, and has a special place in her heart for children and animals. 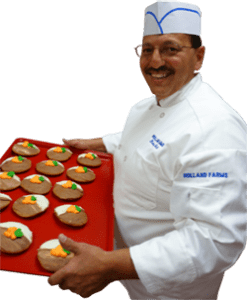 Holland Farms Pies are the Creme de la Creme! But don’t just take our word for it that Holland Farms cream pies are the best around – just ask the 145 Holland Farm customers that served our chocolate cream pie this Thanksgiving… or the 85 customers who served up our pumpkin cream. They’ll tell you that our cream pies, are, well… the creme de la creme! It’s Beginning to Look A Lot Like Christmas… at Holland Farms! If you’re not in the Christmas spirit yet, you should stop in at Holland Farms! Our bakers have been busy stocking our shelves with holiday delights. From our specialty treats like Dutch letters and sticks, stollen, and coffee cakes with fruit and cinnamon crunch, to our specially decorated items, you’re sure to find the perfect treat to satisfy your holiday sweet tooth at Holland Farms. Right now, we’re busy making beautifully decorated Christmas cupcakes that are perfect for children’s parties at school, office get-togethers or special times with family and friends. We also offer holiday cakes whimsically shaped and decorated to look like Santa, elves, trees, and snowmen. They look too good to eat – but they taste great, because they’re made from Holland Farms’ signature cake batter and frosted with our amazing buttercream icing. No time to bake this holiday season? We can help you there, too. We have a variety of decorated butter cookies that taste just like homemade – if you want to tell your family and friends you made them, go right ahead – we promise we won’t give your secret away! You’ll find all sorts of shapes and sizes, like trees, wreaths, snowmen and stockings – they’re just too tasty to eat just one, so bring home a batch! And don’t forget, all of our other offerings are available during the holiday season as well. Have a friend or relative who has moved from the area and misses our half moons? Send them some for the holidays! (Just remember to place your order by Friday, December 16 if you want them to get there in time for Christmas.) And of course, giving the gift of Ramon’s famous New York style cheesecake is always in good taste! What better way to show your appreciation at the holidays than with a delectable bakery item from Holland Farms? Stop in today to check out all of our delicious goodies! Michelle B. – Got a special delivery in Raleigh NC, a box of half moons! They were so yummy! So glad you shipped them to us!